For every musician who becomes a household name, there are hundreds, probably even thousands who toil in clubs for many years, getting a whiff of success every now and then but never quite climbing that ladder to the top rung. At some point they must realize that they are never going to get there and yet, they toil on, maybe because they love music or maybe because it’s the only thing they know. Danny White was born and raised in New Orleans. After serving in the Army in California he returned to the Crescent City and began his music career with a band called the Cavaliers who played at clubs like the Golden Cadillac and the Sho Bar. It was there that White was spotted by the legendary Huey “Piano” Smith who helped White get a deal with Ace Records. White recorded several singles for the label but none of them got much attention. During this time White also made a quickly forgotten single for Dot Records. 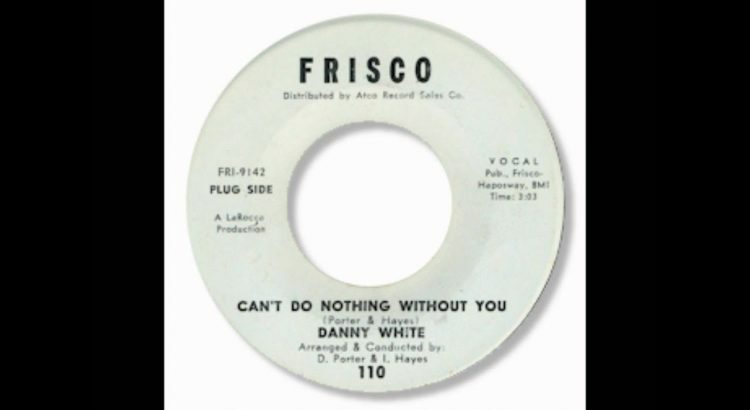 White didn’t give up, however, and before long he met a woman named Connie LaRocca who had started a label called Frisco. LaRocca’s A&R man was Al Reed and Reed had written a song called “Kiss Tomorrow Goodbye.” White went into the studio with another legendary New Orleans musician, producer Wardell Quezergue, to record Reed’s song. The resulting single was a hit throughout the Gulf Coast and even though White tried hard to replicate the success of the single with tracks like “Loan Me a Handkerchief” and “Love is a Way of Life” he never seemed to be able to match that first Frisco single. At that point, looking for something to spur White’s career, LaRocca thought that the answer might be found in Memphis. It was there that White hooked up with the dynamic production team of Isaac Hayes and David Porter to record a gem of a ballad called “Can’t Do Nothing Without You.” Sadly, the single didn’t score and neither did a follow-up called “Note on the Table.” When Frisco shut down, White stayed in Memphis and signed with Stax so that he could continue to work with Hayes and Porter. The team recorded another powerful single, “Keep My Woman Home” b/w “I’m Dedicating My Life.” Among the backing musicians was guitarist Steve Cropper but large scale success continued to be elusive. White’s moved on to record with producer Bowlegs Miller and their collaborations featured the Hi Records rhythm section as well as the Memphis Horns. Singles from that period included “Cracked Up Over You,” Don Bryant’s “You Can’t Keep A Good Man Down,” and “Taking Inventory,” which was written by Eddie Floyd. The provenance of the next White recordings remains unclear. The productions are credited to the New Orleans team of Marshall Seahorn and Allen Toussaint but it’s quite possible that tracks like “Natural Soul Brother” and “One Way Love Affair” were leftovers from the Bowlegs Miller sessions since the sound of those records is quite similar. Despite the renown of the producers that White worked with and the quality of those recordings, White never quite managed to break through. He finished his recording career with a single for Kashe Records, “King For a Day,” b/w “Never Like This.” White was done as a performer by the end of the 1960s although he stayed in the game by becoming the manager of the Meters at the start of their career. But by the early 1970s, White quit the music business altogether and moved to Washington, D.C. He died in 1996 and although he never became a household name many of his recordings are treasured by soul music aficionados.